Roland Henderson’s exhibition “Been” concludes at 5pm today, 5 May (CCAS – Canberra Contemporary Art Space, Manuka, Canberra). CCAS explain the work as a response to travelling, belonging and a sense of place. The photographs in the exhibition each focus on an object or small group of objects including the reverse side of photo frames, toy birds, cabbages, a dandelion in a cup and doll parts. It’s like a collection of memories. 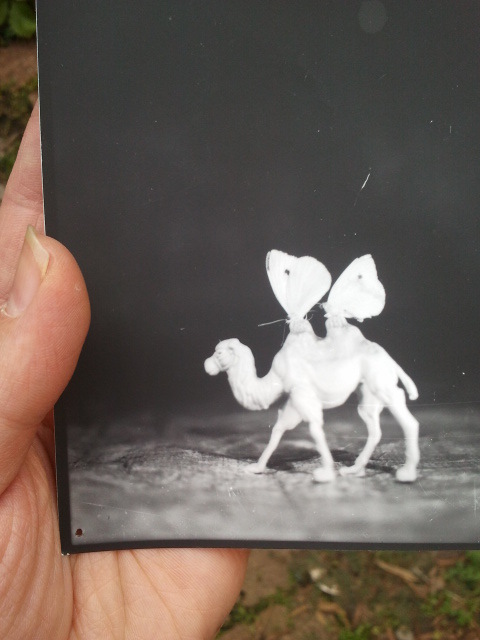 My favourite was an image of a toy Bactrian camel with a cabbage butterfly perched on each hump. It almost appears like a flying camel, but given the scale it’s more magical to think about giant butterflies. So now it’s at home with me – I even got 4 nails with my purchase! (plus a fantastic story about cabbage farming). The next event at CCAS Manuka is Cue Funktion, opening at 6pm on Thursday May 10. This will transform the gallery space into a pop-up venue for live music – combining visual works and musical performances.